Habitat for Humanity is well known for its work organizing volunteers to build homes for those in need. But did you know that Habitat also accepts large and small donations of new and gently used items? The Habitat for Humanity ReStore donation centers accept home improvement items, building materials, fixtures, appliances, furniture, housewares, and decorative items. They sell these in their resale stores at greatly reduced prices to help fund the building of Habitat homes. These nonprofit ReStores are independently owned and operated by local Habitat organizations. Each ReStore has a donation procedure and list of currently accepted items. Most stores will gladly offer to come to your home or business to pick up large items for donation. 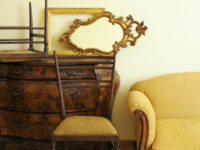 To donate surplus or leftover building materials or other home items, type in your ZIP code here. This search will provide the phone number and location of the ReStore nearest you. If you are planning a remodeling project or cleaning out your attic or storage unit, consider donating your used items to a ReStore. You’ll reduce clutter in your home, minimize landfill waste, provide a usable item to someone at a great price, and help fund Habitat for Humanity projects!